Sometimes you just can’t decide what to brew. You want to try all your exciting new single-origin coffees, but you don’t want to get crazy hopped up on caffeine. Well, we’ve got way around that. All you need is our newest coffee combo pack – the Hario V60 dripper plus a set of three 2.5oz tubes with some of our favorite single-origin coffees. We’re going to brew 3 small cups (about 6oz) of each so that we don’t have to play favorites and choose just one. Weigh out 15g of the first coffee you want to try, and grind it pretty fine (coarser than espresso, though). Put a filter in your V60 and rinse it to remove the papery taste before putting in your coffee and placing over your favorite mug. Heat 250g of water. Pour 30g over the grams and let them bloom for 20 seconds (normally we would say 30 seconds for the bloom, but it’s a small cup). Pour the rest of your water over the grounds, aiming to finish at 2 minutes total brew time. Remove the filter, swirl your coffee, and smell it! Since you’re brewing several coffees today, it’s a great opportunity to notice the differences between not only tastes, but aromas as well. 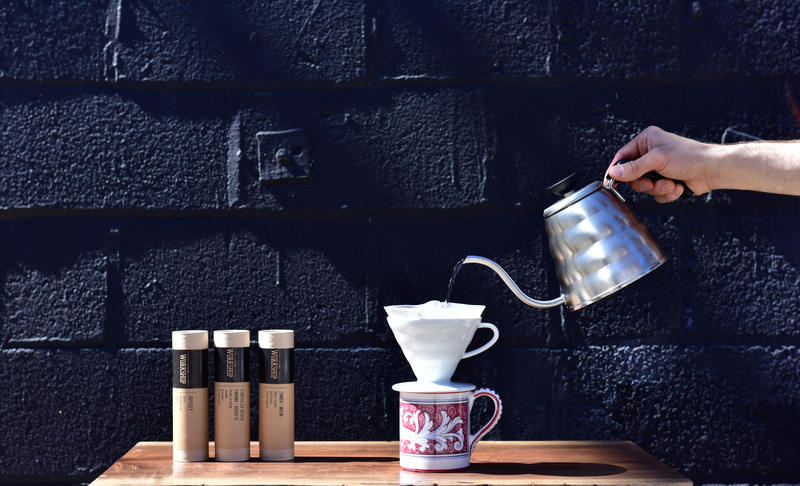 While you’re sipping your first coffee, noticing all the unique flavors, set up the next one and repeat steps 1-4. Then do it all over again. *Pro-tip: Save a little bit of each cup as you’re brewing the next one – the flavors of coffee change dramatically as it cools. Compare the three brews when they’re hot and when they’re cold – you’ll be surprised! Have questions about brewing at home? Shoot an email to social@lacolombe.net.